1 cup shredded cheese Mexican blend is great! Cook hamburger until browned. Drain the fat and stir in taco mix and 1/2 cup salsa/picante sauce. Simmer for 3-5 minutes. Press wonton wrappers into mini muffin cups. 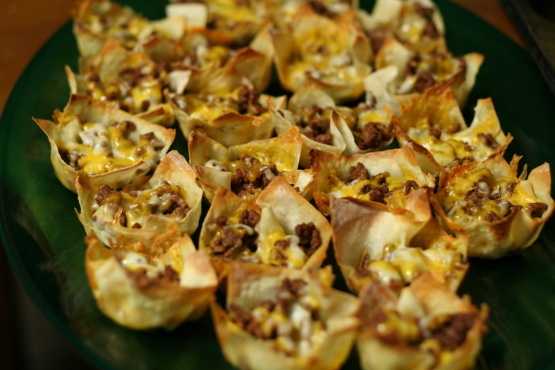 Spoon beef mixture in cups and top with the 3 tbsp of salsa and cheese, evenly divided. Bake in preheated 425°F oven for 8 minutes, or until the wontons are nicely browned. Serve with extra salsa, sour cream, olives and guacamole if desired. Makes 24b mini tacos.